Your goal is to trap all the monsters by pushing the bricks. If you run into a monster, you die. 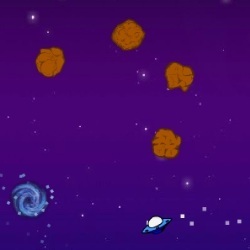 Play in multiplayer mode across 15 levels or in single player mode with 10 levels. 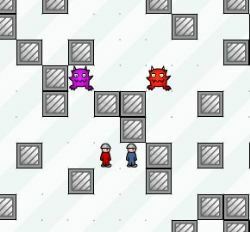 After level three of multiplayer, one player can only push bricks vertically, while the other player can only push horizontally. Try find someone to play with, multiplayer is much more fun. 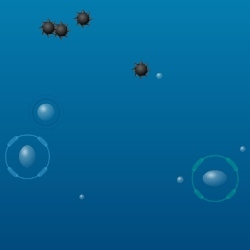 In single player, move using the arrow keys. 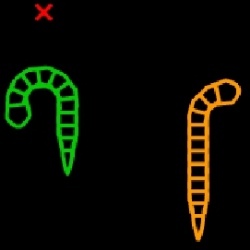 In multiplayer, one player moves using the arrow keys, and the other player moves using the WASD keys. Press "P" to pause and "R" to restart. Click here to send Cooperative Monster Containment to your friends using your default email program.